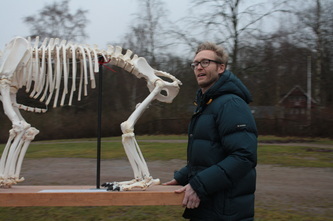 _ The first activity within the project was a photo session at Skånes Djurpark (Scanian Zoo) in Höör, Sweden. Fear photos were taken with skeletons whereas the Hope photos were taken with live otter, lynx, arctic fox, and bison. The event took all in all two full time days to perform, excluding work to edit and retouch the pictures. The large turnout of volunteers (models, photographers, makeup team, staff from the zoo etc) at this photo shoot shows that the cause Fear and Hope is striving for is attractive and leads to that many people engage on a volunteer basis. One of the models even flew to Sweden from London for this specific occasion. This kind of attraction and interest of the Fear and Hope brand is essential.